There are two types of people in the world. Those who know how to fish for carp and those who wish to learn. Which are you? If you are the latter, then you have come to the right place. This is our basic guide on how to fish for carp. 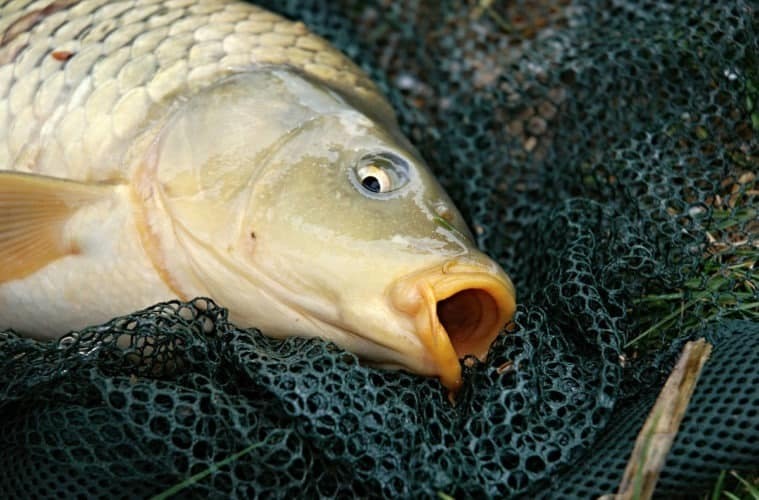 In this post we are going to cover some of the basics of carp fishing. This guide is mainly intended for novice anglers, but really anyone who is trying to catch carp. I trust my years of fishing experience will enable you to catch a carp without too much hassle and without blowing lots of money on unnecessary gear or equipment. Carp is a family of freshwater fish which consists of a number of species that originated in Asia and Europe. However, they have been successfully introduced into all the continents in the Western Hemisphere to such an extent that they are considered in some areas to be a pest because they have successfully ousted some of the indigenous species of fish. As a food source they play a very important role in the diets of many Eastern countries, but their gastronomic properties are not that highly valued in most of their new locations. Most carp species have a deep, robust body with colours ranging from silver and yellow to gold and green. Some of the species can achieve a considerable weight and this is one of the reasons why they are such a sought-after sports fish. What they sometimes lack in fighting abilities compared to other fish species (eg. speed and aggression) they definitely make up for in dogged fighting ability due to their bulk. Carp are mainly bottom feeders, meaning they scour the bottom of a river, pond or lake in search of food items. Most species are equipped with external sensory organs around the mouth area to assist in this quest. Natural foods consist mainly of insect larvae and other small invertebrates occupying the mud and detritus at the bottom of a body of water. Depending on the size of the lake or pond you intend to fish as well as the location of the fish, fishing rods may vary from between 2 to 3 metres. Nowadays most rods are made of carbon and, depending on your budget, you will definitely be able to find something suitable within your price range at a respectable retailer. The same goes for reels. A good, solid fixed spool reel will do the trick adequately. I use a fishing line of around 4-kilogram breaking strain. My terminal tackle is a 1-metre leader of around 6-kilogram breaking strain. At the business end of the leader, I prefer long shank hooks varying between sizes 2 to 6. These types of hook allow the angler to effectively impale a night crawler as a lively, juicy morsel. Alternatively, cover it with a substantial amount of corn kernels or any other preferred bait. Some other equipment that can come in handy during a fishing outing include waders, fishing rests, hand nets and keep nets. Again, these items are sold in a variety of shapes and sizes and it is down to each individual angler to decide the specific item that they want or need. There are various brands on the market all selling products of varying quality. Please be aware of the fact that you can buy most quality equipment at a fair price and it’s really not necessary to rob a bank in order to catch a fish. The difference in quality, durability and performance between a product at a reasonable price and something that is very expensive is, in my opinion, mostly negligible. However, I do understand that some people attach a lot of faith in very expensive equipment or brand names while others buy it purely because they are able to do so. Each to their own I say. However, in my long fishing career, I have seldom, if ever, been out fished by someone with more expensive equipment. When rigging up my tackle I first slide a ball sinker onto the main line. After that, I attach a swivel to the end of the main line and then attach the leader to the other end of the swivel. Now you have a free running line unimpeded by a static sinker. With a free running leader, carp can pick up the bait without detecting any resistance which would be the case if fishing with a static sinker. The weight of the sinker can vary between 10 to 30 grams, depending on the length and flexibility of your rod as well as the casting distance. A good idea is to buy a few sinkers of different weights and test them with your setup prior to your fishing trip in order to find the right balance. One of the classic baits for carp still remain earthworms or night crawlers as they are referred to in the US. However, it is not always easy to get hold of these critters and it is therefore prudent to also stock up on alternative baits. Fortunately for the prospective carp anglers there are a host of baits that will attract carp and they are easy to get hold of in tackle shops or sports stores. You can even make them yourself. Because carp are quite catholic in their diet one can start off with something as mundane as white bread and from there move onto more exotic dough mixtures and additives including a variety of ingredients such as honey, aniseed and curry powder. Feel free to do some further reading in this regard and don’t be afraid to try different combinations. Personally, I prefer the very simple method of buying a tin of sweetcorn and stringing up the individual corn kernels on a long shank hook until it is completely covered. Carp typically tend to form schools, especially when there is a constant food supply available. For the prospective angler this is quite important information because it allows you to create a feeding area prior to starting fishing. This will definitely improve the hook-up rate. Like most other fish species, carp is highly sensitive to various environmental conditions like water temperature, air pressure and the ph level of the water. I would advise all novice anglers to start reading up on these factors because, not only will it improve one’s general knowledge with adding some interesting facts, it can also can assist greatly in planning a successful fishing trip. As indicated earlier, preparing a feeding place before commencing with fishing is very effective when hunting carp. This can be done in different ways with a variety of baits. A simple, yet effective method, is to knee bread, corn, mincemeat, dog pellets etc. into a dough ball about the size of a golf ball. These bait bombs are then launched into the lake targeting the area where you intend to eventually drop your baited hook. This can be done by either throwing them manually or using a catapult of some sorts sometime before actively starting to fish. After the ground baiting has been done, set up your tackle, attach your preferred bait, cast out to the target area and hope for the best! Last but not least, remember to make sure that you adhere to local rules and regulations pertaining to fishing in that specific location and obtain the necessary license and/or permit to do so. There is only so much reading on the topic you can really do before you just get out there and actually try to fish for carp. After reading my article on how to fish for carp, my advice now is to grab your rod and head out to your nearest fishing spot. Remember to practice catch and release and handle any caught fish with care and respect. I furthermore welcome healthy debate. I’m well aware that there are differing opinions regarding fishing. So if you have something to add to the discussion then feel free to comment below. Enjoy!